10am Tierza Davis - owner Pura Vida Adventures in Costa Rica - from a dot com bomb in the late 90s to surfing coach for executive women, Tierza has a story you won't want to miss. 1030am Michelle Bersell - psychotherapist and life coach talks about "Weathering the Financial Storm". Whether you are unemployed, self-employed or afraid that you may not be employed for long, you need to hear what Michelle has to say. 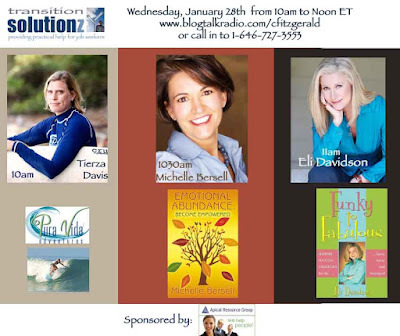 11am Eli Davidson - author of Funky to Fabulous - If you are tired of all of the discouraging news in the marketplace, you should put aside whatever you are doing from 11am to noon tomorrow and tune in to Eli. She will make you laugh, make you think and will inspire you to reinvent yourself. Everywhere you look there are companies laying off people. The numbers are staggering. The Solutionz Group wants to be proactive and help those in our industry struggling with this issue. 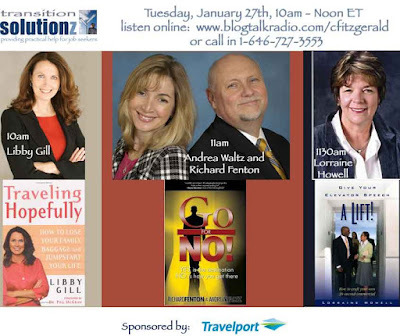 The Transition Solutions series will be broadcast on BlogTalkRadio.com/cfitzgerald on Tuesday, Wednesday and Thursday from 10am ET to Noon ET. The series will include interviews with top authors on various practical topics such as creating your own personal brand, honing your elevator speech, creating a winning resume and more. The series is suitable if you are a job seeker, if you are in a company or an industry where employment is tenuous at best or if you are an HR director or manager that is having to deal with laying off employees. For those of you who read this blog faithfully, first, thank you. And second, I apologize that I've been AWOL. I've been in Dallas at the Shop America Tours Global Summit. Thanks to Rosemary McCormick for inviting me to speak about the drive market, a subject which my loyal readers know that I'm passionate about. I also spoke about the Girlfriend Getaway market and with my passion about the Executive Girlfriend's Group, you can surmise that to be a hot topic with me as well. Put yourself in the shoes of a mall developer. You own malls all over the US. You instinctively know that travelers spend more than local residents and further than international travelers spend more per trip than domestic US travelers. You may not know that Brazilian and Japanese shoppers are some of the most prolific shoppers. What you may not realize, is that people who drive in their own vehicles (e.g. the core of the drive market) spend more than those who fly. It is simple really. If you can buy whatever you want and not worry about having to buy an extra suitcase and pay an excess bag charge or worry about stuffing it into your existing luggage and perhaps exceeding the weight limit, then you will spend more with less constraints. This is a good thing. So what is the best way to attract travelers to your malls? One of the other interesting things that came out of the conference for me was the validation that the drive market is NOT an economy market. In a panel of four 5 star hoteliers, they each stated that their client base arrives by car more than 75% of the time. Although I knew this to be true from our own research, Solutionz is embarking on a sponsored, syndicated study of this market, in conjunction with our research partner, Mandala Research. It is our hope that this empirical study of the drive market will break the log jam that has kept the travel industry from pursuing this lucrative market. If you want to attract the drive market to your mall or to your hotel, I'm happy to help you do a "drive market audit of your property. If you would like to sponsor the syndicated research, please contact me at chicke@solutionz.com. Today we are starting a new series on transition as a part of our Transition Solutionz practice. There are many of our friends and colleagues in the travel industry and in fact most industries that find themselves in transition, so we have decided to focus on marshaling resources to help. For some, you've been employed with the same employer for as much as 15-20 years and finding yourself back out in the job market is a little like getting back into the dating game after being divorced from a long term marriage. Good Morning America today had a good segment on the Top 10 Tips to Get your Resume Noticed. Let's start with that today to start our tip series and tomorrow we'll give you our take on how to deal with your own transition. We will be announcing soon the details of our new social broadcasting network called Solutionz Live™. Our inaugural programming to kick off the new network will be a series of live interviews on BlogTalkRadio with authors and experts about transitioning, refining your own personal brand and fireproofing your career (if you are still gainfully employed). Stay tuned for the full schedule, the new Solutionz Live blog and link to the show schedule on BlogTalkRadio.com. This morning I had the pleasure of being featured, along with my buddy Chris Dane, on Fox Business' Money for Breakfast. Due to Chris' proximity to New York, he was in the studio. I on the other hand elect to be in Florida, which is replete with palm trees and 330 days of sunshine per year. Although it is only going to get up to the high 60s today in Tampa and we have yet to see the sun, it is 26 degrees in New York today, so I think I made the right decision! Bottom line and the point of this story is that I was the "remote feed" from the local Fox affiliate. Now Fox isn't exactly an entrepreneur but the tip I share today is one that they could have learned from this morning. I arrived at the studio at 7am as instructed. I proceeded to the area they had set up for the remote interview (which was to be sometime between 730am and 8am), got "miked" up and got that earpiece put in my ear. Now that made me feel like a government agent for a few moments (with the curly transparent cord) which was cool. But then I found out that Fox in New York couldn't see the image. Ah well. The technicians with the local Fox affiliate kept saying the requisite "not my problem" and New York didn't care whose problem it was as long as they could at least get me on the phone for the interview. So at the end of all the wrangling, I did the interview by phone. It was fun, albeit very short. My lesson for the day? I should have gotten up at 5am instead of 530am and gotten there at 630am. That would have given the local affiliate more time to work it through so they could be a shining star in the Fox network! PS I just checked and they haven't posted the video yet. Hopefully by the end of the day, it will be posted to their video archive site. I'll let you know! No one is immune from mistakes. Whether it is totally unintentional, or whether you made an uninformed choice or you thought you were making the right decision, if you are wrong, it is really important to fess up and quickly. Yesterday on our Executive Girlfriends' Group call, we had one of the first female pilots in the industry, Continental Captain Karen Kahn. Karen told a story about how once upon approach to LAX, she spilled some water on the instrument panel, rendering her display screen unusable. At no time were the passengers in danger, as pilots are trained to land even when instruments fail, but upon landing, Karen had a choice. Not only are each one of these choices right or wrong, they each have consequences. Choice #1 is the cowards way out and is flat out wrong. Karen's job is to get the airplane and its passengers and/or cargo from point A to point B safely. But her job extends to ensuring that the entire system works smoothly and that the next time that aircraft is used, that it can leave on time and operate safely. Choice #2 is better, but doesn't take it all the way. It would have taken maintenance much longer to deal with the problem if they didn't know what was spilled and they might have made a much more expensive repair than needed. Either way, Karen would have been remiss in not reporting the full circumstance to maintenance. Choice #3 is absolutely the right way. Karen had just spilled water on the console. If she had spilled something sticky or sugary or something with milk or carbonation, it would have been dealt with in a totally different manner. As it was, it was a quick fix. The maintenance person was able to take a hair dryer, get rid of all of the moisture and everything was working fine. There was no delay and no costly repair. But more importantly, if Karen had made choice #1, she would have felt guilty about it all day, particularly if she heard later about a delay on that aircraft. And anyone who knew how she handled it would have lost respect for her and not trusted her to do the right thing moving forward. If she had made choice #2 and later heard about a costly repair on the aircraft or a lengthy delay (or both), she also would have felt bad. At that point, she would have had the chance once again to fess up, or just remain quiet, which as you can imagine, leads down the same path as choice #1. Choice #3 left her with a clear conscience and her integrity was left intact. Her co-pilot would have still had respect for her and perhaps even more than before the mistake was made. As I've said, we've all made mistakes. It is how we handle them that really matters. It isn't just doing what is right. It is doing it quickly and rectifying the mistake as swiftly as possible. Corporate life doesn't always reward the admission of guilt. But you should always behave as if you are the owner (e.g. the entrepreneurial way) and that you will have to be fully responsible for the consequences of the mistake. You should also always behave as if everyone is watching. Your integrity depends on it and so does moving forward and not only recovering, but coming out stronger and better than before. Two in one day. Enjoy. I loved this article that talks about the notion of Return on Insight as a new form of measurement of success versus Return on Investment (or perhaps as an adjunct so that you don't make your CFO apoplectic). The author, David Armano, contends that you need to listen, learn and adapt and you need to do it quickly to remain competitive and to achieve profitability. Differentiation. It is the manna of the entrepreneur. There is nothing more abhorrent to an entrepreneur than status quo and "same old, same old" or worse yet - commoditization. Creating differentiation sets us into motion and is what electrifies us down to our toes. You have to step back and read some of the great tomes on this if this doesn't resonate with you. Blue Ocean Strategy is one of my favorites. It is about creating uncontested market space and making the competition irrelevant. Oh yeah. That is what gets us jazzed. Another is Becoming a Category of One. Enough said. If we sit back and continue to do what we've always done (e.g. matching the competition, lowering prices or creating incentives), we'll get what we've always gotten, or worse, our market will decline. Another of my favorite reads is The Disciplines of Market Leaders. The tag line on the book is "choose your customers, narrow your focus, dominate your market". I have used the framework from this book in many consulting engagements to help companies achieve a true "customer centric" focus, which is at the heart of differentiation. More tomorrow on customer centricity. See you then. Both Orbitz and Travelocity this week announced new leaders at the helm. Orbitz now has a technology savvy, operationally capable, marketing focused executive who is talking already about social media, which could imply new models afoot for the OTA. Orbitz had been outpaced by Expedia and Travelocity in the advertising model/social media capabilities, but does it really help them materially to do a "me too" offering to match Trip Advisor and iGoUGo? Just weeks ago, Amadeus founding CEO Jose Tazon stepped down from the CEO role with David Jones, his number two taking the helm. Company veteran Philippe Chereque moved from his role as head of strategy to become the company's Chief Commercial Officer, replacing Jones. Sabre puts its own COO at the helm of Travelocity, not replacing him in the Sabre organization, but instead splitting his job amongst his peers. Is it time to go from 3 GDS companies down to two or are the firms just further tightening their belts for their private equity owners? I am trying to decide whether this more closely resembles the astronauts running out of oxygen in Apollo 13 or is it more like Sid and his buddies in Ice Age, with the temperature around them changing, wondering if the woolly mammoth can hold on? OTAs are now quite mature at more than 10 years old (with Orbitz being the baby of the bunch at just under 9 years old). The GDSs are the granddaddy of the industry at 30 years old on average (with Amadeus as the baby at just under 20). Their models are old and tired and fraught with challenges as the air travel sector (whom they all depend on for as much as 90% of their revenues) contracts with the economy. Just 15% of all travel in the US is by air and just 22% of all spending is done by air travelers (according to the recently renamed Travel Industry Association nee USTA). That number isn't expected to improve anytime soon, as airlines continue to contract their networks and reduce both frequency and capacity. Travel suppliers continue to push online shoppers to shop on their own sites, leaching business from both the OTAs (which actually makes financial sense for them) and from the traditional travel agent (which makes no sense whatsoever as outlined in previous posts), which impacts the GDS directly. The OTAs and the GDSs must open their eyes beyond the air traveler to support the drive market, which represents 85% of all trips annually and 78% of all spending. For the 10 and 30 years that these folks have been around, the air traveler market has been sufficient and it has been good to them, with double digit margins. With the pressures from shareholders - whether IAC and the public at Expedia, or from Blackstone and TCV for Travelport and add in the public for Orbitz, or TPG and Silverlake at Sabre/Travelocity, the OTA business and the GDS industry has to expand its horizons and realize that the ecosystem is changing. The good days are over Sid.... the wooly mammoth IS in danger. And the air is getting very thin in the spacecraft for Apollo 13 astronauts. Time for a change. Where will it come from? Face it, getting up and going to work is hard enough when you have a solid paycheck coming in every two weeks like clockwork, paid vacation, health, dental and life insurance, 401k matching, etc. etc. Imagine for a moment being an entrepreneur. Your life savings is safely ensconced in the company you've been building for 2 1/2 years. You haven't taken a salary for that same time and you know the meaning of the word "highly leverage" first hand. I know it sounds a bit loopy (as my friend Jane from Australia would say), but it is true. True entrepreneurs (or serial entrepreneurs as we're often called) are known for having an "idea a minute". So we live and breathe inspiration. If we are smart, we couple ourselves with one or more detailed oriented people that can actually execute one or more of our ideas, as we frequently are bored with the execution phase once things are moving along smoothly. In corporate life, inspiration is not generally a core value and often "inspiration squashing" is the sport of the interminable meetings and conference calls. Unconstrained brainstorming is rarely tolerated without 10 reasons why the "new, new thing" won't work. Try a slice of inspiration tomorrow morning with your toast and coffee. For a whole day (ok, a whole hour if you can manage it), take everything off your desk. Sit quietly for a few minutes (or a few seconds for the ADD folks in the bunch) and just dream about what you would do today if you could remove all constraints. Having the right talent to get it all accomplished! This is the right fodder for strategic plans. When you read a plan, you should get excited. It should make you get out of bed and RUN to work, even if you weren't going to receive a paycheck for the forseeable future! We may be an undisciplined bunch, but having been in Corporate America for the first 18 years of my career, I can tell you with great assurance, we have way more fun! And the BIG secret..... we get more done with WAY less, much faster. Inject some entrepreneurial spirit into your company today. I was interviewed yesterday on BlogTalk Radio. I talked about the Executive Girlfriend's Group, Solutionz Group and some of the companies that we are incubating (LeisureLogix RoadEscapes.com, HotelsbyHospitals, etc.). I am the second interview on this one hour show hosted by Jason Crouch and Ken Cook. Click on the segment on the right that begins with TS Elliott (no, not the dead poet). I got tired of hearing the music from the show each time I opened this blog! I had a very interesting call this morning with a woman who is a part of an organization that is spearheading entrepreneurial education at the high school level. She used the phrase that the group is "electrified down to their socks" about teaching entrepreneurship as early in life as possible. I realized as she was talking that I too am electrified, perhaps even down to my toes about not only being an entrepreneur, but passing on my knowledge about what makes entrepreneurs different from people in corporate life. We are, after all, all business people. Right? For those of you who know my daughter Kiera (aged 10), you know that she is a natural entrepreneur. She is always writing or working on some new idea. Like mother, like daughter. 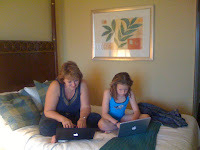 In fact, as I sit in the lobby of the Omni Hotel in Orlando, I'm reminded of the day before our Disney Cruise last spring when Kiera and I were in this very hotel, side by side, working on something or other so important that we had to bring our laptops on vacation! On several occasions I have taught entrepreneurial business in Kiera's grade school - to 4th graders and to 5th graders. And the cool thing is - they get it! They are SO practical and insightful. We could use a bit of that in adult businesses, entrepreneurial or not! To get back to my call this morning, it occurred to me that not only do we need to teach entrepreneurialism to kids, but it might be good to come up with some entrepreneurial tips for our corporate bretheren, so as I wrap up my DOING MORE WITH LESS Series, I think I'll start a new series on Entrepreneurial Tips for Success. I'm about to hop on a radio interview, so for now, I'll leave you with some insight on being an entrepreneur from one of the greatest, Sir Richard Branson. CLICK HERE to see his interview on entrepreneurialism on American Express OPEN's site. One of the people that I follow on Twitter and via RSS feed is Guy Kawasaki. Some of you heard him speak a few years ago at TravelCom. While you are getting settled back at work, I'm going to provide some wisdom from one of his posts. I'll be back tomorrow with more in the DOING MORE WITH LESS series.